Carers who are supporting people with dementia in a group setting can apply to do the 3-day Sonas Course. The group setting is most often a nursing home, hospital or day care centre. The Sonas Course is carried out by skilled healthcare professionals who have significant dementia expertise and experience. The courses are held in venues nationwide, with numbers limited to maximise learning. They can also be delivered as an inhouse training. The Sonas Course is certified by the Nursing and Midwifery Board of Ireland (NMBI), with Category 1 accrediation (19 CEU points). It is suitable for Activity Co-ordinators, Care assistants, nurses, Allied Health professionals, and others caring for with people with dementia. The course takes place on three days over a 10-week period. Work-based learning is also an integral part of the training. Upon completion of the Sonas Course, participants are certified as Sonas Licensed Practitioners (SLPs) with a licence valid for two years. Licence renewal involves training, either through an eModule or a refresher training day. Every year, more than 300 people in Ireland become Sonas Licensed Practitioners SLPs, with a further 100 completing Sonas Licence renewal training. The Sonas eModule was written with the support of Dublin City University’s eLearning team. The Sonas eModule is designed to provide the Sonas Licensed Practitioner (SLP) with refresher dementia and Sonas Programme training and encourages reflective learning. It takes just four hours to complete and refreshes the Sonas Licensed Practitioner’s (SLP) knowledge and skills. It is easy to complete, with a step-by-step guide and short video. The Engaging Dementia training team can be contacted by phone or email if the Sonas Licensed Practitioner has any difficulties with the Sonas eModule. Moodle, the elearning platform through which the Sonas eModule is delivered, also has an SLP forum and resources for Sonas group and individual sessions. Every Sonas Licensed Practitioner (SLP) has a login to Moodle. If you are a Sonas Licensed Practitioner (SLP) and haven’t yet accessed Moodle, just call Engaging Dementia’s training team for your login details. The 1-day Sonas Licence Renewal Training Day is focused on building on the Sonas Licensed Practitioner’s (SLP) skills. 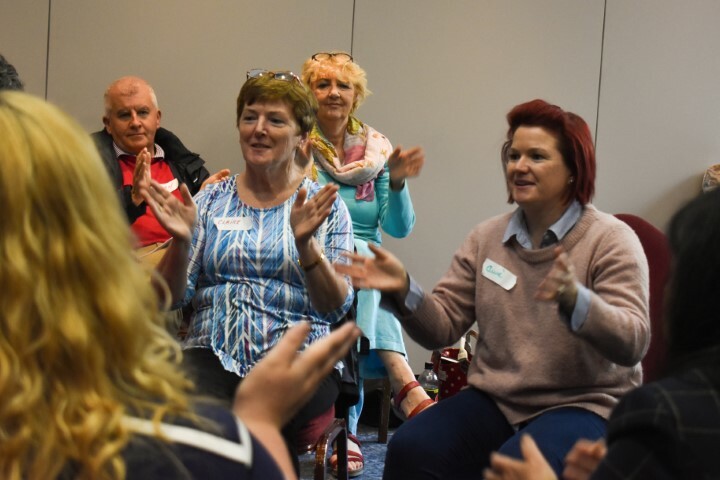 It is based on the practice development learning method, with skilful facilitation to enable attendees to reflect on their own practice and share their experiences of carrying out Sonas Group, Sonas Individual Multisensory (SIMS) and Relaxing Individual Sessions. It is a forum for troubleshooting and learning. Time is also devoted to how SLPs are documenting the Sonas sessions and whether it is being done in a way that best meets the needs of the people who take part in Sonas sessions. The Activity Co-ordinators, nurses, Allied Health professionals, care assistants, and other carers who undertake this training will have already completed the 3-day Sonas Course and the Sonas eModule in the previous two year Sonas Licence training cycles. Upon successful completion of the Sonas Licence Renewal Day attendees will have their Sonas Licence renewed for a further two years and receive an updated Sonas Licence Certificate and badge. The Sonas Licence is valid for 2 years.